It’s funny that our friends’ Khmerican wedding is the first Cambodian wedding I’ve been to, despite being in the country for nearly two years. 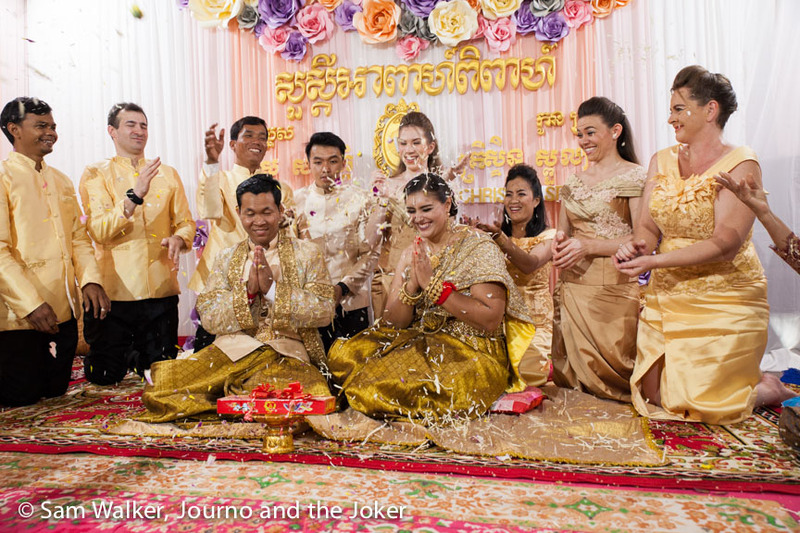 So I was excited to join this traditional Khmer wedding celebration — with an American twist — when these two beautiful people tied the knot on the weekend. 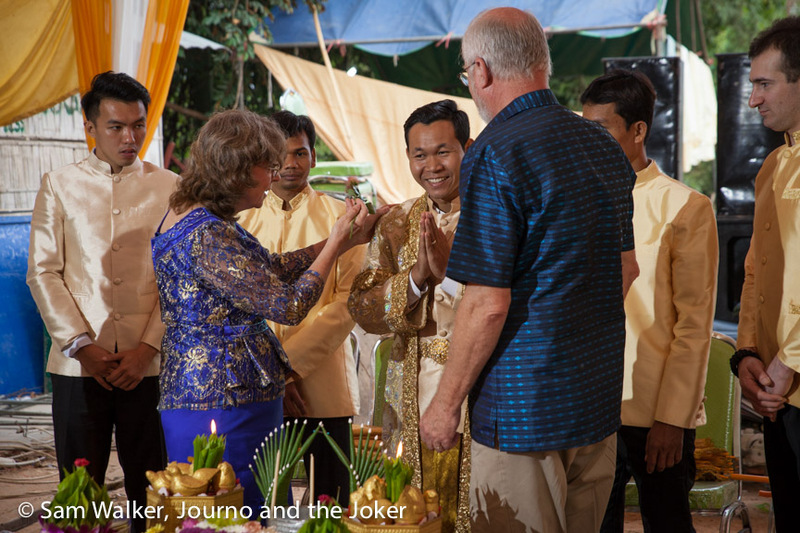 Many people who visit Cambodia for even short periods get invited to weddings. The invitation list is a lot more liberal than a western wedding and the main party night or banquet often caters for five or six hundred people. Cambodians invite their friends and friends of friends and random strays. But most only go to the big party at the end. We’ve been invited to a few but we’ve not been able to make it for various reasons. 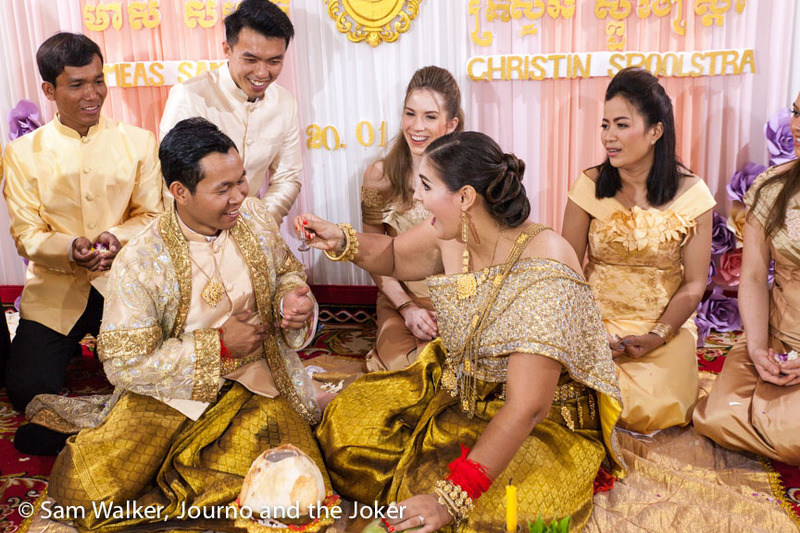 But I’m glad this one was my first and that I was there for more than the party — there’s so much more to a Cambodian wedding and it was great to have friends explaining what was going on. 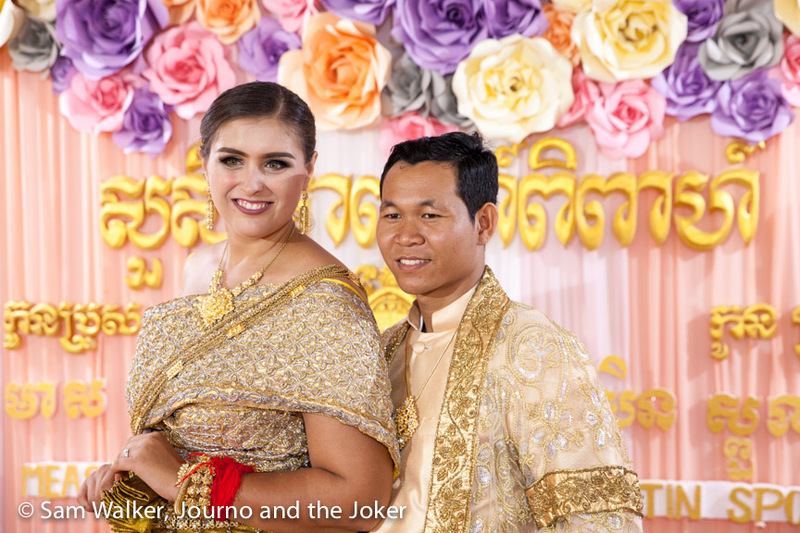 It’s wedding season in Cambodia at the moment. And it’s hard not to know about it — the main ceremonies usually happen at the home of the bride’s family. First you see the truck arrive with all the framework and the plastic tables and chairs. Soon a big marquee is erected in front of the family home, draped in colourful chiffons — more often than not right in the middle of the road, with traffic being diverted around it. Sometimes it blocks the entire road and vehicles have to choose another route. Sometimes motorbikes ride right through the middle of the tent. The tables are covered and the loud speakers are set up. Yes, loud speakers. Because it seems to be the Cambodian way to announce the celebration to all the world, so they make it loud. And you know you are in for days of loud plinkety plink music, singing, chanting, people coming and going and traffic diversions. The Cambodians take all this in their stride. It was pitch black and I was startled out of a deep slumber by the bleating of the alarm. It was 4.20am and I briefly wondered about the sanity of this decision. But it is not every day you are invited to take part in cultural experience as significant as a wedding and so I clambered out of bed before I could fall asleep again. It was day two of Christin and Sambath’s wedding celebrations and with just a few ceremonies in the morning we were determined to be there for them — and that included the sunrise ceremony. 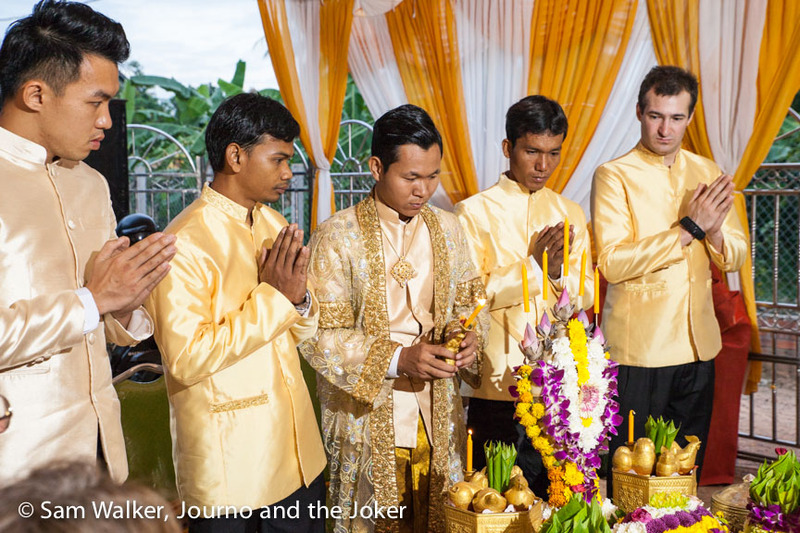 This ceremony, to honour the sunrise, was only for the groom. And unfortunately I missed much of the significance behind it. But I got the pics. Honouring the sunrise was followed by the candle ceremony or the passing of blessings. In this ceremony married couples form a circle around the bride and groom and three candles are lit and passed from person-to-person. It’s believed married couples will pass on the success of their own marriage. The candle goes around the circle seven times. The flame represents anger but the smoke is believed to be sacred enough to protect them. So as the candle passes around each person waves their hand over it, pushing the protective smoke towards the bride and groom. The final ceremony is the knot tying ceremony. 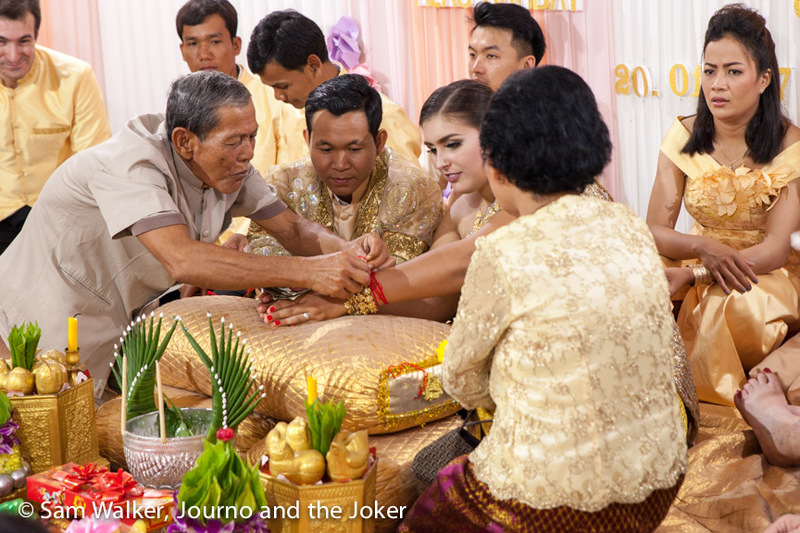 In this ceremony family and close friends can present the bride and groom with a gift of money and tie blessing strings on the wrists of the couple. Then there was this cheeky little ritual. I’m not sure the significance of the coconut and feeding each other coconut juice but it was clearly a bit of fun. It finishes with the throwing of palm flowers. 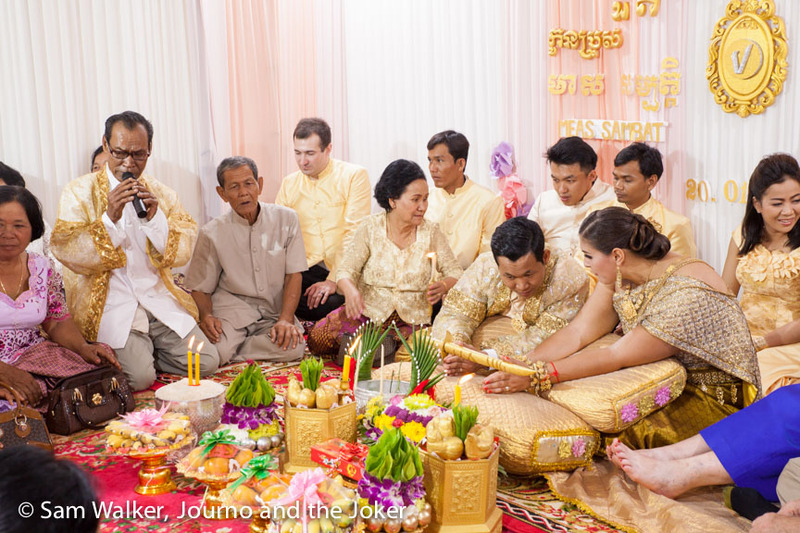 Of course a big part of a Khmer wedding is getting dressed up for the banquet. So a few of us decided to make last minute appointments at the hairdresser and get our hair all tizzed up. I left it in the hands of the hairdresser so I ended up with a slightly 1960s look, but it was all a bit of fun. 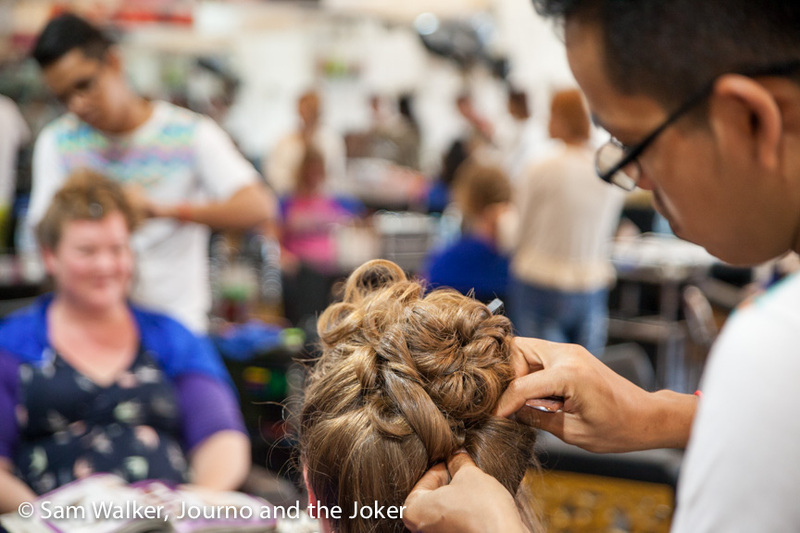 There was enough hairspray in this do that even a ride in a tuk tuk was not going to move it out of place. They supplied (well, we paid extra) for some pretty hair pieces to add to the effect. 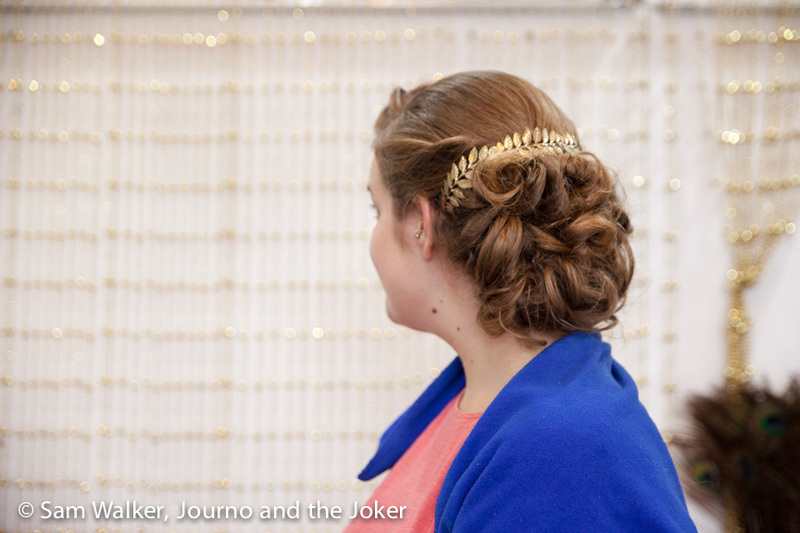 Sarah’s gorgeous thick hair looked stunning in this up do. And Gemma’s was a work of art. With her long locks reaching all the way down her back, even when curled, there was a lot of hair to work in and the hairdresser masterfully piled it all on top of her head. We originally planned to head to the market for our hair styling. But when an air-conditioned salon was recommended for just a few dollars more we opted for the cooler location. Thankfully Yut was there to help explain what was required and what we did or didn’t want. He’s a patient man — he sat and waited in the salon for the hour or two it took for us to all get tizzied up, occasionally getting up to make sure everyone was ok. The Joker would have headed for the nearest bar and a cold beer. But we were all thankful for his translations as we sat nervously in the salon chairs, pointing at pictures of hairstyles we liked and watching as our hair was straightened, then curled, teased and fluffed and pinned and finally soaked in hairspray and set in place for the night ahead. 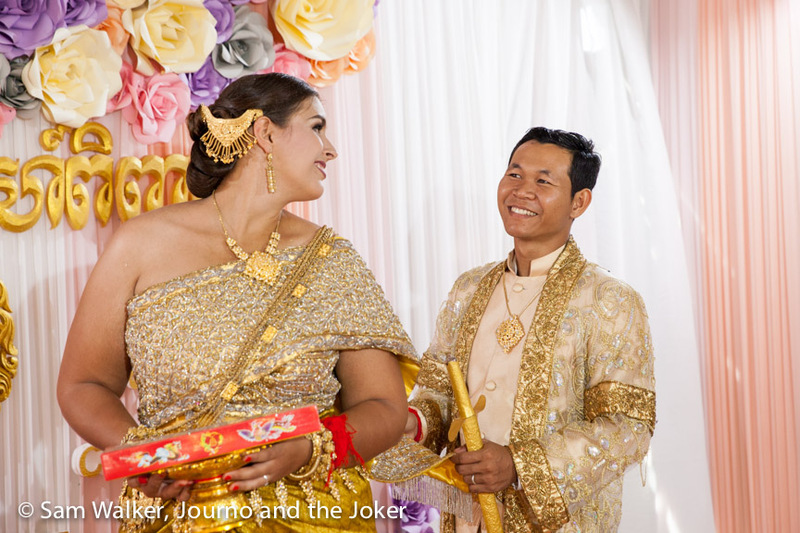 Cambodian weddings are long affairs usually lasting two or three days, filled with numerous ceremonies and culminating in a banquet and party on the final night. We thought we’d have an “in” to all that was going on because we were with Khmer friends who could explain it all. It turns out it was all new for many of them as well, because most of them also just go to the party at the end and not the many other ceremonies. Wedding season is usually in the dry season, which makes a lot of sense. In wet season families are often busy planting or harvesting rice. And the roads at this time turn to mud, making accessibility a problem and keeping costumes, elaborate dresses and hair and make-up respectable almost impossible. Costumes are an important part of each ceremony and there is usually a different costume for each ceremony with certain colours to coincide. The bride and groom wear matching costumes. There are many ceremonies. They all have some significance or purpose and when you find out what is going on some of them are really beautiful. As couples increasingly shorten the wedding from three days to one or two they are leaving some ceremonies out and choosing the most important ones or those they believe most relevant to them. The multiple ceremonies usually also mean multiple costume changes, and for the bride – hair and makeup changes — and early morning starts for the bridal party. Think three or four in the morning. 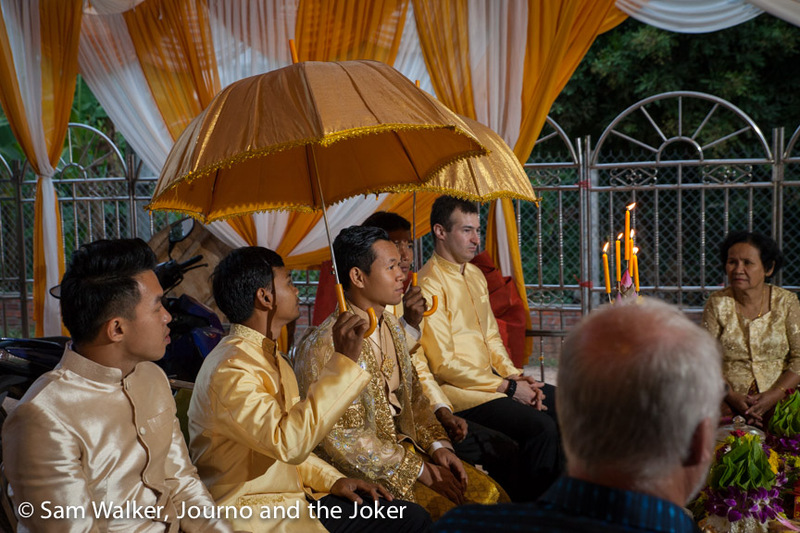 The groom’s procession and dowry presentation — in this ceremony the groom and his family bring gifts to the bride and her family and wedding rings are exchanged. The call to ancestors — Throughout the wedding family and friends offer their blessings at different times. In this ceremony, family and friends who have passed away are called on to offer their blessings. 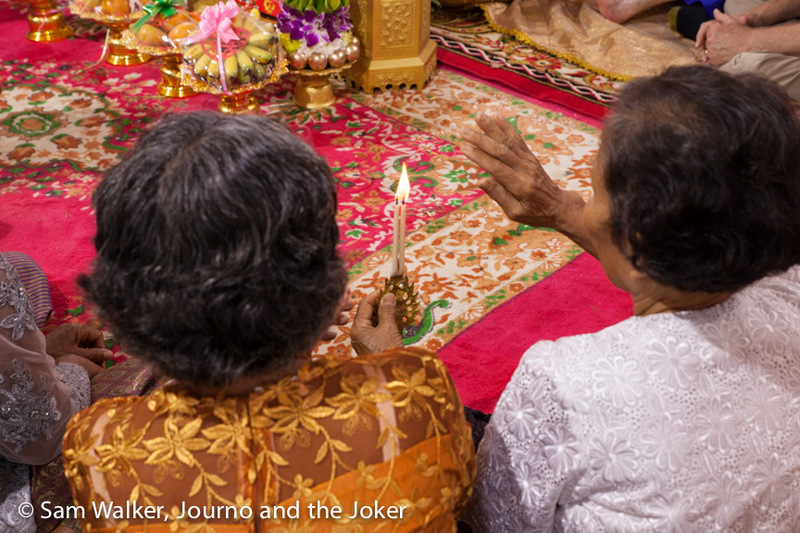 Blessings from the monks — the monks offer blessings specifically chosen for the bride and groom. Hair cutting (cleansing ceremony) — friends and family take turns to symbolically cut the bride and groom’s hair. The hair cutting represents a fresh start for the newly weds and happiness, prosperity and longevity. Honouring the parents — a reminder of the hardships of raising a child and that now the children should start to look after their parents. Thank you for the opportunity to share your special day. We wish you a lifetime of happiness together. Samnang L’aor. Interesting story, Sam. Missed you both at Christmas again. Hope we can meet again soon. Missed all of you as well. Look forward to catching up one of these days. Hope you are both well.